Today’s email to my Monday Meditation list was a letter to the late Dr. Martin Luther King Jr. Instead of producing the entire text in my blog, I have linked it here as an archived email. 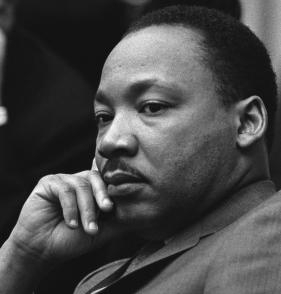 >Without question, in many regards Martin would find deep gratification in the strides of “The Movement.” Nevertheless, today he would still “weep over Jerusalem.” Hear the voice of the prophet: “I am convinced that if we are to get on the right side of the world revolution, we as a nation must undergo a radical revolution of values. We must rapidly begin the shift from a “thing-oriented” society to a “person-oriented” society. When machines and computers, profit motives and property rights are considered more important than people, the giant triplets of racism, materialism, and militarism are incapable of being conquered. A true revolution of values will soon cause us to question the fairness and justice of many of our past and present policies. On the one hand we are called to play the good Samaritan on life’s roadside; but that will be only an initial act. One day we must come to see that the whole Jericho road must be transformed so that men and women will not be constantly beaten and robbed as they make their journey on life’s highway. True compassion is more than flinging a coin to a beggar; it is not haphazard and superficial. It comes to see that an edifice which produces beggars needs restructuring. A true revolution of values will soon look uneasily on the glaring contrast of poverty and wealth. With righteous indignation, it will look across the seas and see individual capitalists of the West investing huge sums of money in Asia, Africa and South America, only to take the profits out with no concern for the social betterment of the countries, and say: “This is not just.” It will look at our alliance with the landed gentry of Latin America and say: “This is not just.” The Western arrogance of feeling that it has everything to teach others and nothing to learn from them is not just. A true revolution of values will lay hands on the world order and say of war: “This way of settling differences is not just.” This business of burning human beings with napalm, of filling our nation’s homes with orphans and widows, of injecting poisonous drugs of hate into veins of people normally humane, of sending men home from dark and bloody battlefields physically handicapped and psychologically deranged, cannot be reconciled with wisdom, justice and love. A nation that continues year after year to spend more money on military defense than on programs of social uplift is approaching spiritual death. America, the richest and most powerful nation in the world, can well lead the way in this revolution of values. There is nothing, except a tragic death wish, to prevent us from reordering our priorities, so that the pursuit of peace will take precedence over the pursuit of war. There is nothing to keep us from molding a recalcitrant status quo with bruised hands until we have fashioned it into a brotherhood.” Excerpt from: Beyond Vietnam: A Time to Break SilenceBy Rev. Martin Luther King 4 April 1967Speech delivered by Dr. Martin Luther King, Jr., on April 4, 1967, at a meeting of Clergy and Laity Concerned at Riverside Church in New York City April 4, 1967 … exactly one year before his assassination by the principalities and powers who will not tolerate such truth. 1967 … 2007 … where is the change?